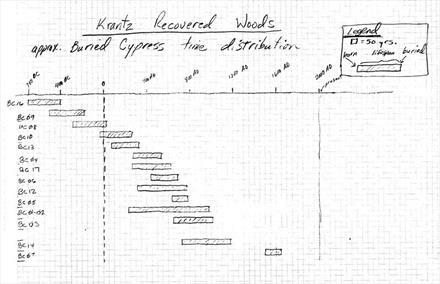 This simple graph illustrates approximately when each of the 14 buried Cypress trees lived and died. Of particular interest is that none of them died (and fell into the soft soil) at the same time. We think it was either "old age" or a weather event like a hurricane that brought them down randomly, over thousands of years.